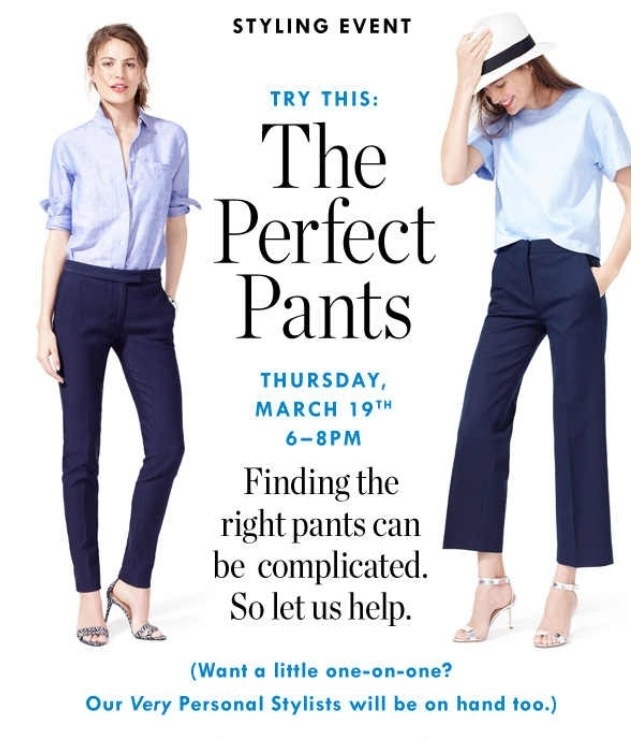 …find your perfect pants at J. Crew! Whether you’re looking for skinny, slim, wide leg, straight leg or drapey options, they can hook you up. I’ve got my eye on the Reese Pant in neon persimmon. I’m just not sure about the elastic waist, although I love the pair I received last year. The streamlined Martie Pant is more my speed…but they don’t come in neon persimmon! I’m definitely not sold on the short culottes I see people wearing. But that’s the point of this event and the Very Personal Stylists: to help you discover options you might avoid initially. Plus, did you know J. Crew offers teachers and college students a 15% discount (in-store only) on regularly-priced merchandise with valid ID? Well, now you know…and knowing is half the battle!